With the next-generation iPhone’s announcement and release approaching for next month, one of the most present rumors is a larger, nearly-four inch display. A larger iPhone display has always been at the top of many iPhone user wish-lists, and it appears that the next iPhone will fulfill that. Back in mid-May, we reported that the next-generation iPhone would feature a taller display that comes in at 3.999 inches diagonally with a resolution of 640 x 1136. At this resolution, Apple would be retaining the current horizontal length of the iPhone display, and only increasing the height. This taller display information was soon affirmed when we posted the first photos of purported next-generation iPhone parts. These parts demonstrated this taller screen with the same horizontal length. We soon heard from sources that a few of the next-generation iPhones in testing within Apple feature a display that matches the parts. These next-generation iPhones with taller displays feature a home screen that scales to five rows of icons, according to sources. 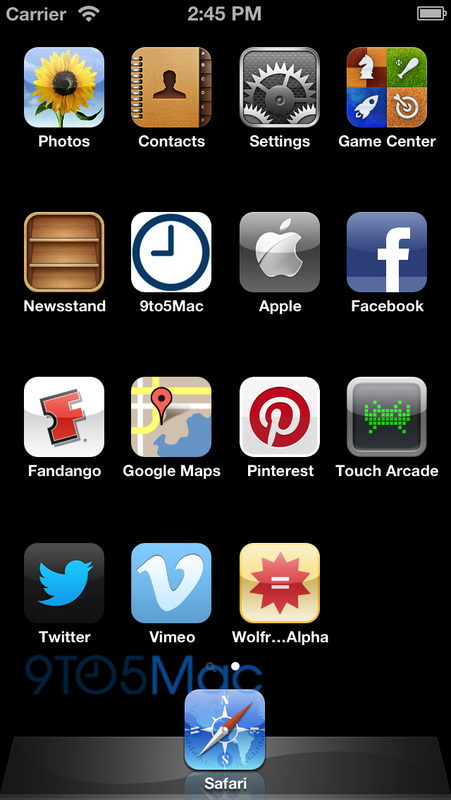 The current 3.5-inch iPhone displays feature four rows of icons. The user-interfaces of Apple’s included applications were also said to be tweaked to take advantage of the taller screen area. Thanks to some tweaks to the iOS Simulator application that is included in the iOS development tools, we were able to run the simulator at the rumored next-generation iPhone display resolution of 640 x 1136. 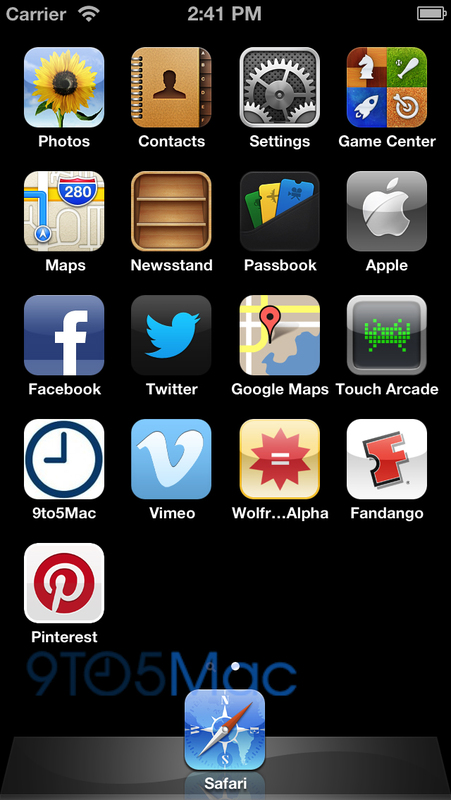 We did this running both the current public release of iOS 5.1 and the upcoming iOS 6.0 The iOS 5.1 simulator displayed the home screen with a stretched set of four rows of icons. On the other hand, iOS 6 displayed five complete rows – as our sources said Apple was testing for taller iPhone displays. 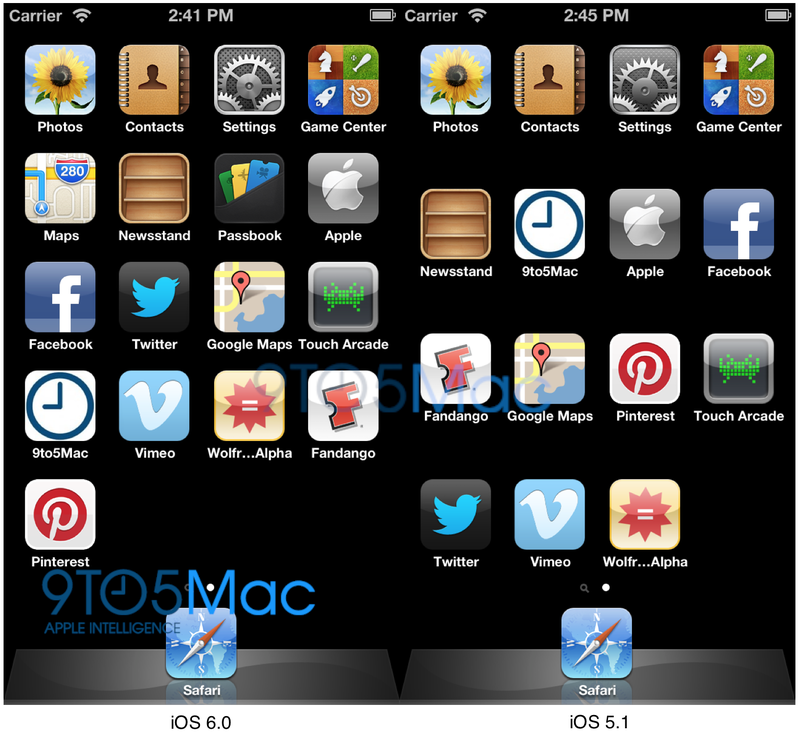 Comparison of iOS 6.0 and iOS 5.1 running at 640 x 1136. Click for larger. This proves that the upcoming release of iOS 6, which will obviously come pre-loaded on the new iPhone, is well-aware of taller iPhone displays. It scales perfectly to the taller resolution. Perhaps even more interesting is that the simulator will not correctly display five rows of icons at resolutions other than 640 x 1136. At other resolutions, the icons will scale to an iPad-like home screen layout, not at the proportions and spacing of the current iPhone and iPod touch display. This may just add another layer of proof that the next-gen iPhone display will come in at a resolution of 640 x 1136. While the simulator running on Apple’s next-generation iPhone operating system is aware of taller displays, and scales perfectly only to 640 x 1136, this is not exactly definitive proof that Apple will go with this resolution and screen size. Apple prototypes multiple next-generation devices, components, and software, so until Apple unveils the new iPhone next month, nothing is confirmed. However, we think that we have proof that the next iPhone’s operating system is definitely aware and supportive of the rumored, taller screen.